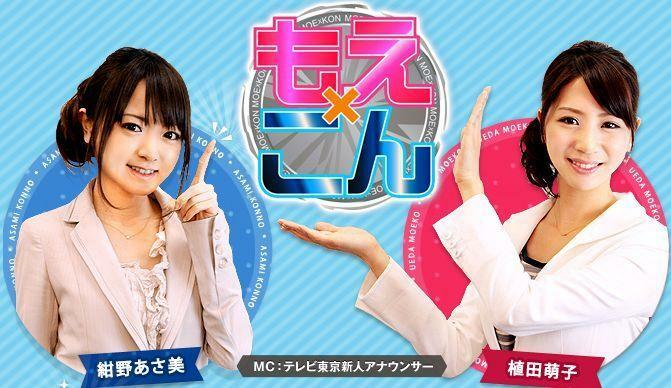 Konno Asami, along with her fellow announcer Ueda Moeko, will be featured on their new show titled Moe x Kon. The theme of the show hasn’t been announced but I’m glad to see that Konno will finally be appearing on a show since it gives fans a chance to check out her show and like the name suggests it features a combination of nicknames for the two hosts: Moe for Moeko and Kon for Konno, which is pretty cute and catchy. The official site only features an image of Konno with Ueda and at first glance Konno looks a bit different but it might be due to bad editing or lighting, although we will find out for sure in a few weeks when the show starts. There aren’t that many details for the show, but hopefully everyone can check it out once it starts airing since the title sounds pretty interesting, although we will find out for sure once it starts. The show will start on 7/11. Konno Asami’s profile has been updated on Tv Tokyo’s page and her blog. I didn’t get a chance to check out her blog before the change so I’m not sure what exactly is different. On her profile page there’s a video of Konkon, it’s a short clip and I believe that she’s introducing herself to fans. Underneath that is some information about her, like her favorite food, music, books, hometown, etc. I’m very interested in the video of her introduction. Like I said before I didn’t get a chance to check out the blog and I haven’t followed Konkon since the Elder Club’s graduation so seeing her video I was very intrigued. First she’s very different from her H!P days, she’s much more serious and I’m sure a tv announcer has to be while they report the news. Another thing I wanted to say regarding the video is she’s less quiet than she use to be. As an H!P member I always though of her as a very shy member. In this clip though she seems more confident but she still has a soft voice. It’s been awhile since Konkon has had any activity so hopefully an updated profile hints that she’ll be doing something soon, even though it’s not a H!P related activity hopefully everyone can still support Konno! Konno Asami has opened a TV Tokyo blog. It seems that all new announcers for TV Tokyo have opened up a blog, and along with them I am glad to see that Konno got a chance to get one as well since it gives fans a chance to follow her in her daily life as she starts her new work as an announcer. The blog so far has one post (the same as all of the other announcer blogs) where she introduces herself to viewers and while she only has one post so far I really liked how the post looked since she had a pretty cute picture of herself posing with her new employee ID along with a few lines where she mentions that she will try her best as an announcer (basically the same as most of the other announcers). Compared to other H!P blogs her entries will most likely be somewhat different since she will most likely want to keep a more professional look although I hope we get to see more casual posts of her talking about the weather or what she is eating (all blogs eventually feature a food entry so it’s just a matter of time). Hopefully she updates it regularly and gives us a look at what her new career as an announcer is like since many fans will most likely be looking forward to finding out more about her. Konno Asami has officially left Gatas Brillhantes to start her new job as an announcer for TV Tokyo. Her message appeared on the official Gatas site alongside a message from the team captain Yoshizawa Hitomi, and even though it is a basic farewell message about how she enjoyed being a member for seven years and how she will miss being a member it is a great message from Konno for fans to read. Since Konno is already pretty much a TV Tokyo announcer it was a matter of time until she announced that she was going to leave the Gatas Brillhantes team since she is no longer an Ongaku Gatas member, and it’s great to see that she had a chance to leave a farewell message to fans who have supported her for so long. I look forward to seeing how Konno does in her TV Tokyo announcer job since she will start this month, so hopefully we get a chance to hear her soon. An FC event for Konno Asami has been announced on the FC site. After the announcement that Konno would become a regular TV announced just a few days ago it seemed that we would hear a lot more news about her and I’m glad to see that is the case since it gives her fans a chance to enjoy a private event and congratulate her on her new job. Not many details are released but the date and location have been announced, which hopefully gives Konno fans a chance to check out their schedules and order their tickets for the event since it will most likely be a great event filled with amazing performances. The FC event will take place on 12/7 and 12/8 at Yokohama BLITZ. According to an announcement by the official H!P site Konno Asami will be an announcer on TV Tokyo by next year. This was mentioned quite a while ago by a newspaper, but I’m glad to see that we finally get a confirmation since it is great news for Konno and her fans everywhere mainly because TV Tokyo is one of the major television stations in Tokyo. There is still quite a bit of time left until we can get to hear Konno as an announcer, but hopefully by then all H!P fans who tune into TV Tokyo get a chance to hear her. Konno will be a TV Tokyo announcer starting April 2011.